What is Concrete Cover for Reinforcement Bar? The distance between the surface of embedded reinforcement and the outer face of concrete of a RCC member is the concrete cover. We often define it as “concrete clear cover” or “minimum concrete cover” in our daily construction activities. See the image below. Why Concrete Cover is very Important for Reinforcement bars? Maintaining concrete cover for reinforcement bars of a RCC member is must for quality of construction. Following are the reasons why we should maintain concrete cover for reinforcement bars. It protects reinforcement bars from bad effect of weather. Concrete cover acts as a thermal insulation of reinforcement bars to protect it from fire. It provides enough embedding to reinforcement bars to enable them to be stressed without slipping. 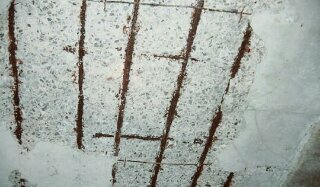 See the image below, how the reinforcement bars be affected due to insufficient concrete cover. How do we maintain concrete cover? There are various types of material and methods used to maintain concrete cover for reinforcement bars. We commonly use cement concrete block and steel bar’s chair for maintaining concrete cover. Concrete cover’s thickness depends on the type of RCC member, Diameter of bar used in the member and exposure condition. It is structural engineer’s responsibility to show the concrete cover thickness in drawings. Most of the time we can find them in the structural drawing. If found you should follow that as specified in the drawing. If you don’t find any instruction for concrete cover in the structural drawing you should follow your national code. 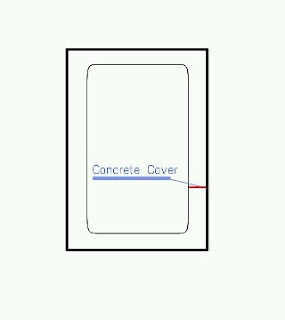 In this post I’ll show you the concrete cover as specified in ACI code. Concrete which is casted against earth and exposed to earth, the concrete cover should be not less than 3 inch. Footing is the example of this kind. * For #11 and smaller bar – ¾ inch. * For bar #14 to #18 – 1½ inch. Whenever said concrete cover means minimum required cover for reinforcement bars. However, excess concrete cover can harm RCC members. Have you liked this post? Then share your opinion in the comment section below….